Washington, D.C., may be the political center of the United States, but Mason provides its students with numerous opportunities that extend beyond the government. Take, for example, Nathan Secrest. The second-year graduate student, who is currently working toward his PhD in physics with a concentration in astrophysics, discovered a miniature supermassive black hole in the NGC 4178 galaxy while conducting research for the School of Physics, Astronomy and Computation, otherwise known as SPACS. That may not sound like a big deal to someone who cannot tell his brown dwarfs from his red giants, but within the scientific community, it can have major repercussions. “The reason why this discovery is significant is because of the size of the SMBH and the galaxy it is hosted by,” Secrest said in an e-mail. “[We] do not know very much about intermediate mass black holes. How are they formed? What percentage of the total black holes in the universe do they comprise? Also, NGC 4178 is a bulgeless spiral galaxy. This is important because the larger SMBH masses have been found to correlate very tightly with the properties of their host galaxy bulges,” said Secrest. At first glance, this information seems too complicated for most to understand but Secrest is able to bring clarity to the importance of the subject. “Generally speaking, the larger the host bulge, the larger the nuclear black hole. We therefore think that there is a deep relationship between the formation of SMBHs and the evolution of their host galaxies,” said Secrest. Secrest discovered the black hole with the assistance of his research advisor, Dr. Shobital Satyapal, and a team of collaborators including Mario Gliozzi, Teddy Cheung, Torsten Boeker and Anil Seth. This group had deduced the presence of an active galactic nucleus in NGC 4178 based on infrared observations by Mason technology. Secrest himself later verified these results using data from high-energy X-rays. Their findings are described in the July 1, 2012 issue of The Astrophysical Journal. 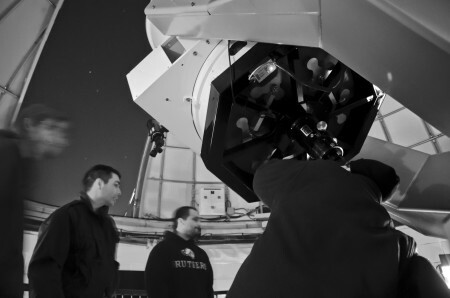 SPACS offers students undergraduate degrees in physics, astronomy and computational and data sciences as well as numerous graduate degrees. Research covers a wide variety of scientific topics, from astronomy and climate change to particle physics and computational fluid dynamics. Undergraduates usually commence on research projects as a part of class assignments, but frequently, they end up continuing with their research after the end of the semester. Students are able to continue working closely with faculty members and use a variety of instruments, including data from the Hubble Space Telescope and other state-of-the-art resources. In addition to research projects, students can also participate in Work Study programs, assistantships and internships both on campus and in the D.C. area. “The research that is conducted in SPACS is almost always published in scientific journals and presented at national and international conferences,” said Michael E. Summers, Director of SPACS and professor of planetary science and astronomy. Still, aside from prestigious career opportunities, SPACS – like many programs at Mason – simply provides a way for students to pursue the things that they are most passionate about.